During the past month our Archaeology Ambassadors have joined us on the foreshore of the Thames for two discovery walks. 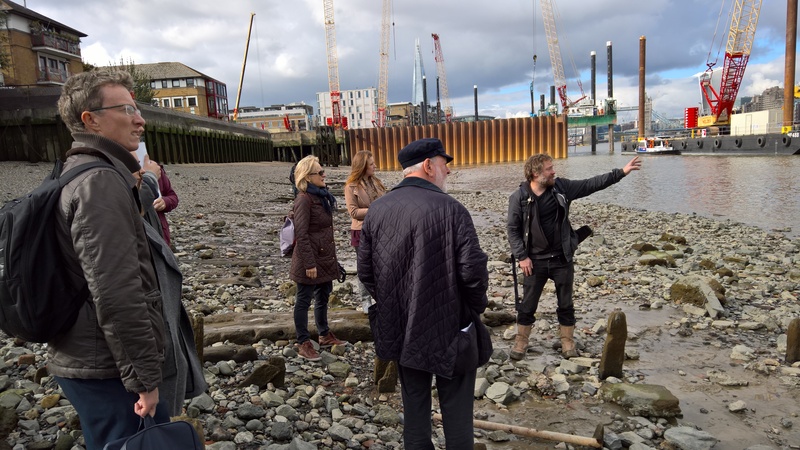 On the 20th October and the 19th November, groups of Ambassadors and their guests were guided along the river by foreshore archaeology experts Eliott Wragg and Joshua Frost, from MOLA’s flagship project, The Thames Discovery Programme. The Thames is home to a plethora of archaeological activity, continually being unearthed with each tide. The Thames Discovery Programme, along with their hundreds of volunteers, works throughout the year to record and monitor the foreshore archaeology that is exposed through erosion. Our Archaeology Ambassadors took time out of their busy schedules to join us at Rotherhithe to learn more about the important work that the Thames Discovery Programme undertake and to discover the fascinating changes that the Thames has undergone over the centuries. The walks explored the foreshore from Hanover Stairs to Kings Stairs giving our Ambassadors the opportunity to learn extraordinary facts about past times including; Ship building through the ages, Second World War bomb damage, the first police station in the UK, the remains of ship-breaker’s yards, Saxon fish traps and modern day river wall erosion. The Thames Discovery Programme archaeologists shared their extensive knowledge to our Ambassadors and their guests. Everyone left far more aware of the extensive archaeology that can be discovered along the foreshore, as well as the detailed work that the Thames Discovery team and their volunteers, FROGs, carry out with each visit. If you are interested in becoming a FROG or joining in with the calendar of events that the Thames Discovery Programme hold every year, please visit their website. We would like to thank our Archaeology Ambassadors for joining us on these unique walks, as well as for their continued support. If you are interested in being an Archaeology Ambassador, please contact our Director of Development and Fundraising, Suzie Haworth, at shaworth@mola.org.uk or 0207 410 2219.